Ancient Arts stained glass studio in San Pedro (http://www.ancientartsstainedglassstudio.com) was first contacted in October, 2006 by Rev. John Janze, pastor of St. Thomas More in Irvine, CA. The church was planning to begin construction of a new Parish Center and Father John was looking for an artist to create the new stained glass windows for the Library and the Blessed Sacrament Chapel. Ancient Arts owner, Mark Schoem, was thrilled to be selected for the project and design work was started in April of 2007. Over the next year, designs were created and approved for three stained glass windows: a window depicting the Archangels, Michael, Gabriel and Raphael for the library and a window depicting Our Lady of Walshingham, also for the library. Our Lady of Walshingham is a depiction of the Virgin Mary from a Medieval shrine in northern England. The shrine of Our Lady of Walshingham is a pilgrimage site that was visited by St. Thomas More, the namesake of the church in Irvine. This stained glass design also incorporates the heraldic crest of St. Thomas More. A third design for the Blessed Sacrament Chapel depicts the Eucharistic symbols of the chalice and host inscribed with the Chi Rho monogram. Rays of light emanate from the sacred objects. A ground breaking ceremony was held on July 5, 2008 attended by parishioners, guests and dignitaries from the Diocese of Orange and the City of Irvine. Meanwhile, following the approval of the stained glass designs in May, another meeting with Fr. John and his associates was held on July 9th to select the colors and textures of the stained glass. By January of 2009 construction progress had advanced sufficiently for Mark to be invited to a construction meeting to finalize the details of the stained glass frames and installation with the overall glazing contractor, the general contractor, the architect, construction managers from the diocese and Fr. John and his staff. Fabrication is currently in progress. The first step is the enlargement of the designs and the cutting of the glass.  After cutting and painting is complete, Fr. John will be invited to another meeting to review the work at Ancient Arts studio before the pieces are assembled with the lead. Installation is scheduled for September of this year. 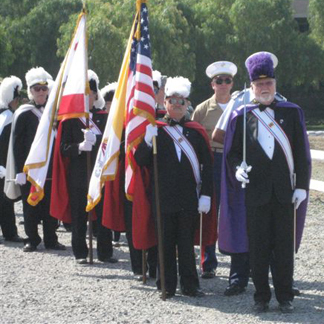 The Knights of Columbus at the groundbreaking ceremony for the new Parish Center, St. Thomas More Church, Irvine, CA, July 5th, 2008. 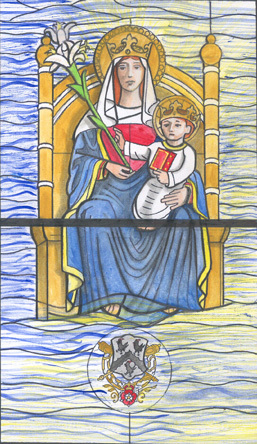 Color sketch for Our Lady of Walshingham stained glass window. Designed for St. Thomas More Parish Center Library, Irvine, CA. 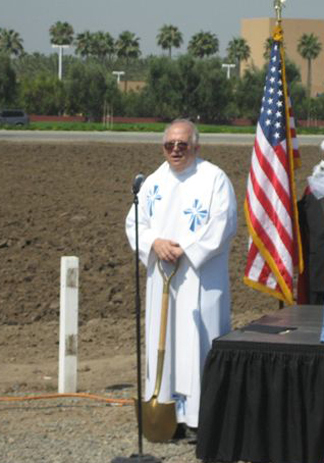 Father John Janze addresses the audience at the groundbreaking ceremony for the new Parish Center for St. Thomas More Church, Irvine, CA, July 5th, 2008.